This paper highlights eight ways to recruit, support and retain a diverse workforce in organisations. Employees are more satisfied and committed when they have positive work relationships with managers and colleagues.3 By supporting diversity, managers and organisations can foster positive work cultures for all. 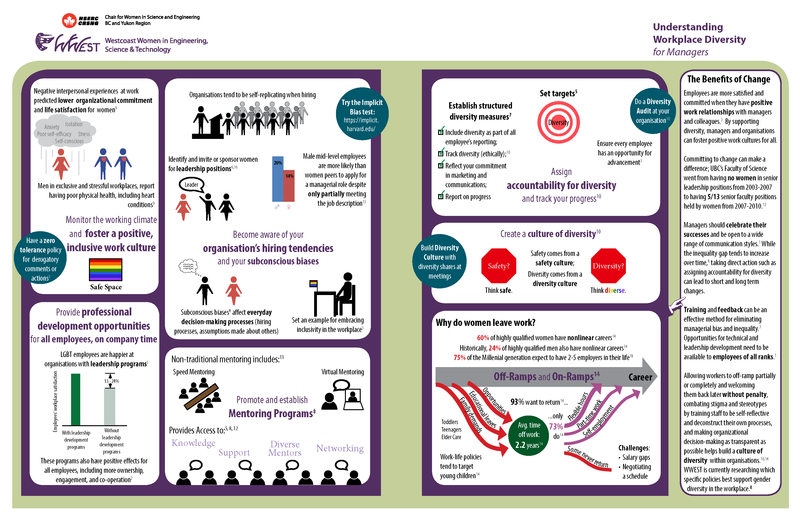 Managers should celebrate their successes and be open to a wide range of communication styles.1 While the inequality gap tends to increase over time,8 taking direct action such as assigning accountability for diversity can lead to short and long term changes. 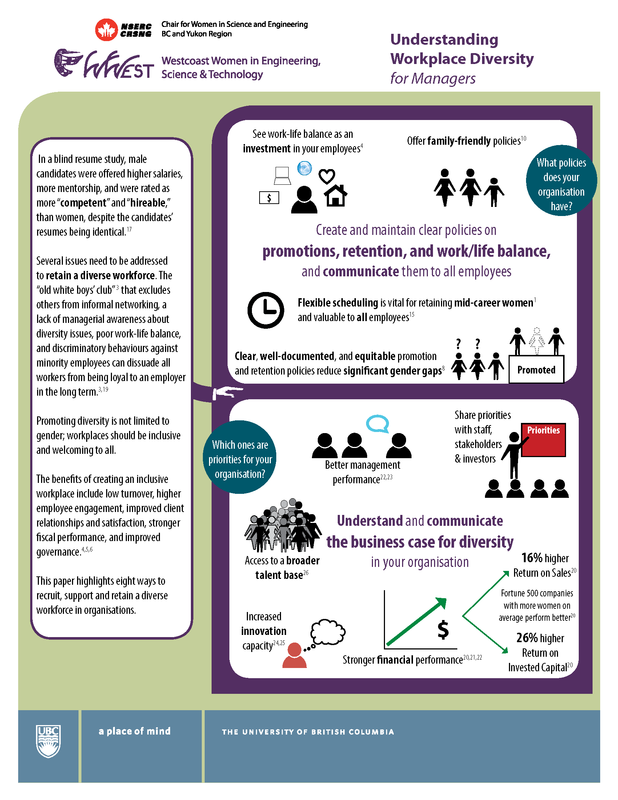 WWEST is currently researching which specific policies best support gender diversity in the workplace. 2. Politt, D. (2012). Leadership programme brings big benefits for Raytheon. Training & Management Development Methods, 26(5), 5109-5114. 6. Mattis, M. (2001). Advancing women in business organizations: Key leadership roles and behaviors of senior leaders and middle managers. Journal of Management Development, 20(4), 371-388. 7. Kalev, A., Dobbin, F., & Kelly, E. (2006). Best practices or best guesses? Assessing the efficacy of corporate affirmative action and diversity policies. American Sociological Review, 71(4),589-617. Psychology Annual Meeting, New Orleans, LA, USA. 12. Condon, A., Hibsch-Jetter, C., Parrish, K. & Peacock, S. (2011). Equity and working climate initiative and outcomes pertaining to tenure-track at science: 2007-2010. 14. Hewlett, S.A. (2007). Off-ramps and on-ramps. Boston, MA: Harvard Business School Press. 15. Servon, L.J., & Visser, M.A. (2011). Progress hindered: the retention and advancement of women in science, engineering and technology careers. Human Resrouce Management Journal, 21(3), 272-284. 16. Davey, K. M. (2008). Women’s accounts of organizational politics as a gendering process. Gender, Work & Organization, 15, 650–671. 17. Moss-Racusin, C. et al. (2012). Science faculty’s subtle gender biases favor male students. Proceedings of the National Academy of Sciences of the United States of America, 109(41), 16474-16479. 19. Ghosh, P., Satyawadi, R., Joshi, J.P., & Shadman, M. (2013) Who stays with you? Factors predicting employees’ intention to stay. International Journal of Organizational Analysis, 21(3), 288-312. 24. Torchia, M., Calabrò, A., & Huse, M. (2011). Women directors on corporate boards: From tokenism to critical mass. Journal of Business Ethics, 102(2), 299-317. 26. Mannix, E., & Neale. M.A. (2005). What differences make a difference? The promise and reality of diverse teams in organizations. Psychological Science in the Public Interest. 6(2), 31-55. 1. Babcock, L. & Laschever, S. (2003). Women don’t ask: Negotiation and the gender divide. Princeton, NJ: Princeton University Press.